The Wolves cause an upset against Leeds on the first night, Wigan get off to good start versus the Dragons. St. Helens maul the Giants, Hull FC pummel Salford back to Manchester. Castleford held by Hull KR and Widnes beat Wakefield in style away from home. The Wire opened the scoring in this first Super League game of the new season with Sandow scoring. After keeping the lead for 20 minutes Leeds scored a controversial try to level the score at six a piece. The Leeds try scorer was Singleton. The game was boring for a good majority of the back end of the first half and the start of the second half, but there were still no tries. The game started to get interesting from 60 minutes onwards and Leeds scored with Hall getting into a tight space, but the angle was so tight Hardaker couldn't kick the goal. In the last 10 minutes Warrington scored from Penny and Gidley kicked the goal. In the last 20 seconds Leeds had a penalty, Hardaker couldn't convert it and the Rhinos lost by two points. Wigan started the game strong a everyone expected and of course they scored the first try of the game. 20 minutes after the first try McIlorum scored his second. At half time Wigan had a 10 point lead over the French side. The Catalans scored a try it was Horo and the score was 10-6 to Wigan. Before anyone thought it could get better for the Dragons it couldn't after Wigan got a penalty and the score was 12-6 to Wigan. When everyone thought the game couldn't get any better Josh Charnley got in and scored a try but it was rued out but it didn't matter anyway, Wiagn had won the game. This was yet another game in round 1 that looked tight on paper but it turned out to be a smashing from St. Helens to the Giants. Percival opened the scoring with Walsh converting. Vea then scored for the Saints. Murphy squeezed in a try for the Giants with Brough failing to convert and Percival scored for St. Helens again to end the half. In the Second half Turner set the Saints flying high with yet ant other Walsh conversion. Ta'ai got another try for the Giants but a 16 point lead in the balance for the home side. Connor put the margin to 10 when the Giants scored and converted from Ellis. Late on Thompson scored the finisher for St. Helens and Walsh converted once agin and scored the penalty to secure a strong 30-16 win for the Saints. A ruthless performance from Hull FC saw them batter a helpless Salford who lost 4 players in the winter. This is how the game played out for Hull. Pryce, Fonua, Thompson and Talanoa scored tries for Hull with Sneyd converting all 4 plus a penalty. Griffin then converted his own try to get points on the board for Salford. At half time it was 26-6 to Hull. 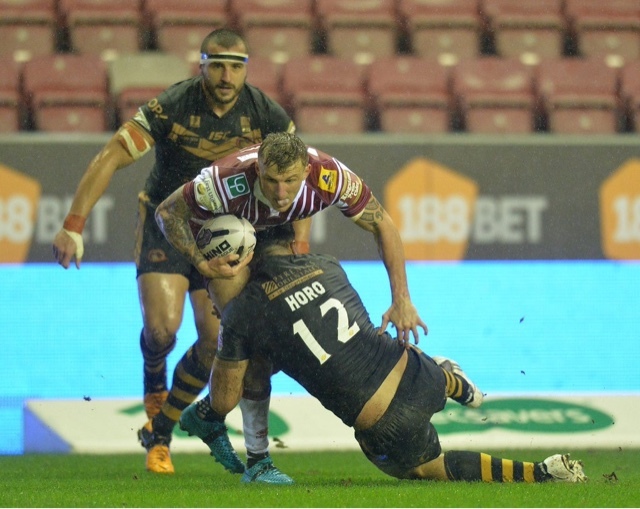 In the second half Tuimavave, Bowden, Logan and Shaul scored for Hull with no conversions. Salford looked for a way back into the game when Sa'u scored twice and Evalds scored with only one conversion from Dobson. Hull FC got performance of the week with a 42-20 win over the Salford Red Devils. Castleford got held up by Hull in a game that the Tigers should've won. 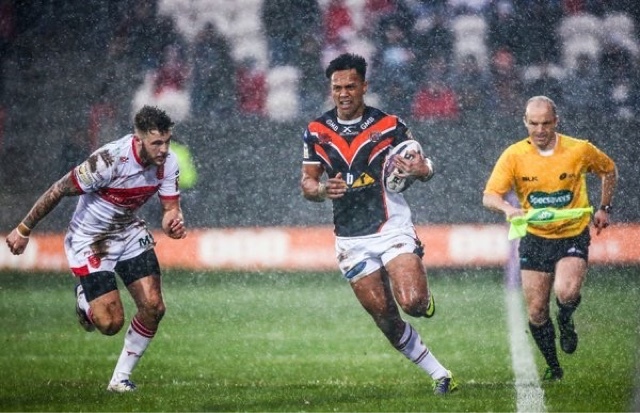 Solomona opened the scoring after a poor start from Cas, Gale managed to convert. Hull KR were straight back in the game when Donaldson got over the line and Mantellato converted. Michael Shenton went down before half time with a right knee injury. At half time the scores were leave at 6-6. After the interval Cas were much the better side and Webster proved that by scoring twice in a matter of minutes with Gale converting once. Castleford looked like winning until out of nowhere Mantellato scored two tries ad son venting once and luckily for the Tigers not twice. The game unbelievably finished 16-16 from a poor Cas performance towards the end of the game. In this game Widnes completely outplayed Wakefield. Sa got over the line twice and Hanbury scored whilst Hanbury converted all 3. For the Wildcats Howarth scored but Finn couldn't convert. That was the dominant first half over and the score was Wakefield 4-18 Widnes. In the second half the Vikings got over the line with White and Hanbury got his 4th conversion of the game. Lyne and Sio scored for Wakefield whilst Finn the found his shooting boots and then converted twice for the Wildcats. After last season poor performance Wakefield kicked off the season not the way they expected to and the full time score was Wakefield 16 - 24 Widnes.